A traditional American toy, the sock monkey makes his appearance here. Much easier to stitch than to make from a pair of socks! 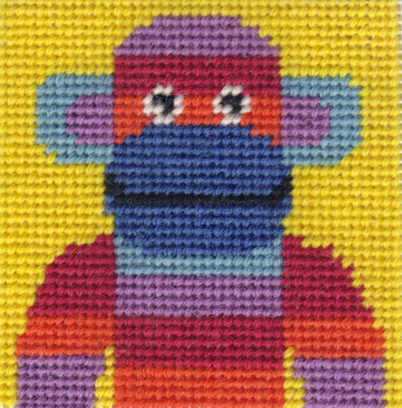 MiniKits are quick, easy and a great way to learn to stitch. The large holes of the 10 count canvas are easy to see for a child or an adult taking their first excursion into the joy of stitching. It is best to learn to stitch on a frame and the right size for this tapestry is here.